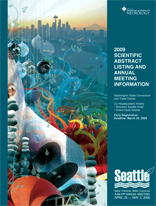 The American Academy of Neurology (AAN) is having its 61st annual meeting in Seattle this year. The theme this year is: "Better Practices, Better Outcomes." The meeting began over the weekend (April 25) and will run until May 2. Doctors still love to attend major national meetings to get thier continuing medical education (CME). I love Seattle. In fact, Seattle is probably one of my favorite cities because of all the outdoor activities that are available in that area. Mount Rainier is such a great park and I think I could spend weeks backpacking throughout the Cascades Range.